On December 3rd, 2016, a second-year civil engineering master student, Yonjan Santosh from Nepal was honored with the Best Presentation Award at the Technical Meeting / General Assembly of the IEEE Professional Communication Society (PCSJ), held at Shibaura Institute of Technology, Omiya Campus. He gave a presentation on the leadership and communication skills he learned as an organizer for TEDxShinshu University in 2015 and 2016, and also discussed the methods of operating a non-profit organisation with student volunteers. TEDxShinshu University serves as a platform to spread ideas from Shinshu to the world, based on its motto, "From Shinshu to the World." 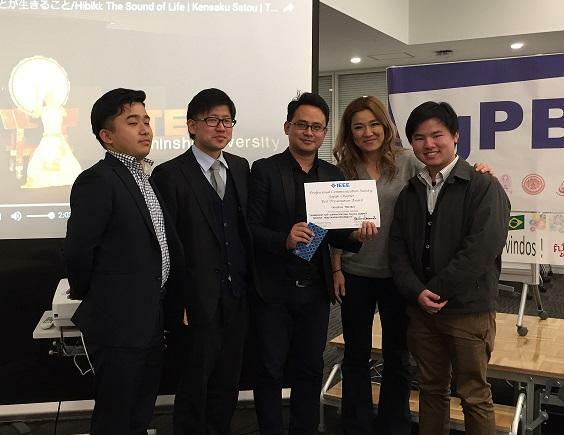 Santosh received a TEDx license during the 2015 academic year, and Shinshu University students (both international and Japanese students) planned and carried out the event. TEDxShinshuUniversity is held in November every year at Faculty of Engineering, and our 2017 team has already began working toward the next TEDx event.